November | 2009 | Star Car Central - Famous Movie & TV car news! there is more than one “holy grail” when it comes to star cars. 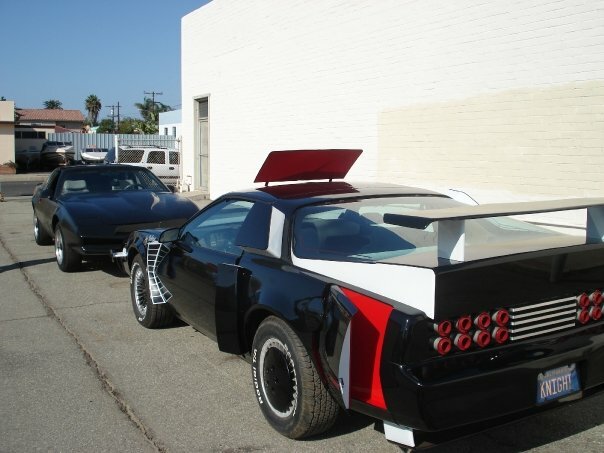 First there was the “pilot” KITT, then the 2 TV dash cars with the new nose, then there came the 1 TV KITT, the two tone silver and black KARR with orange/yellow scanner, and in the last season there was the Super Pursuit Mode aka transformer KITT and the magic convertible. In the age of transformer cartoons and toys, the SPM version with vents and wind wings popping out all over was a kids dream. Well, Jennifer has taken up the challenge, with the help of the Star car central.com team. 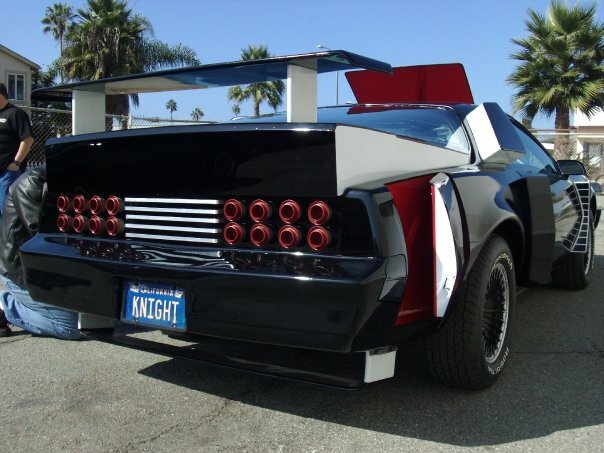 Jay Ohrburg kindly allowed all of the knight Rider fans to crawl all over his static replica (meaning, the stuff doesn’t go in and out mechanically) that my pal Jack in Texas spent months building from scratch all the panels and SPM add ons for Jay. and Brian U. was up to the challenge to do the design for Jennifer. Now all she has to do is build it and pay for it! 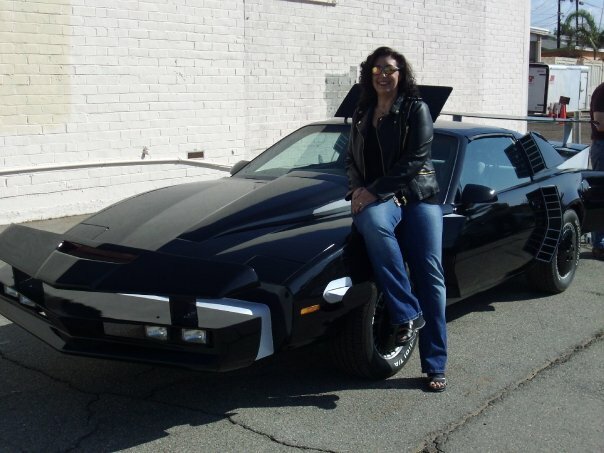 Jennifer is a long time KITT fan, in fact she owned one before, and had to sell it years ago, but now she has the fever again to get her SPM car. I am just glad she is going to build it (and pay for it!) so I don’t have to! 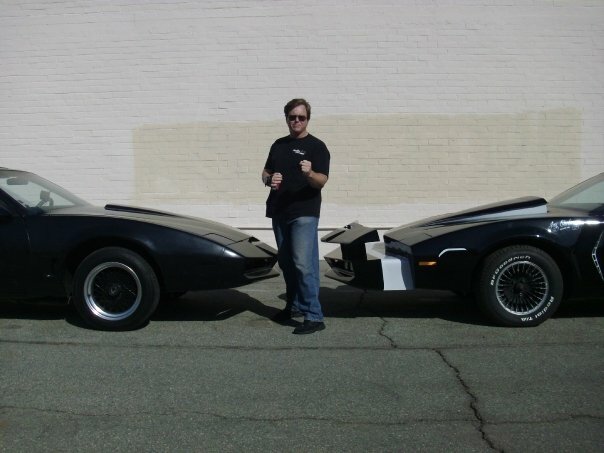 Nate Truman and Jennifer confer on details comparing her “stunt KITT” with the SPM replica of Jay Ohrburg. Lots to do, but I think she is going to do it! Once the word got out that Jen Brian and Nate were going to crawl over the SPM car for measurements, all the Knights of the West Coast decided to stop by! After we all got our fill of the SPM car, we looked around the place and found a few other starcar gems sitting around! 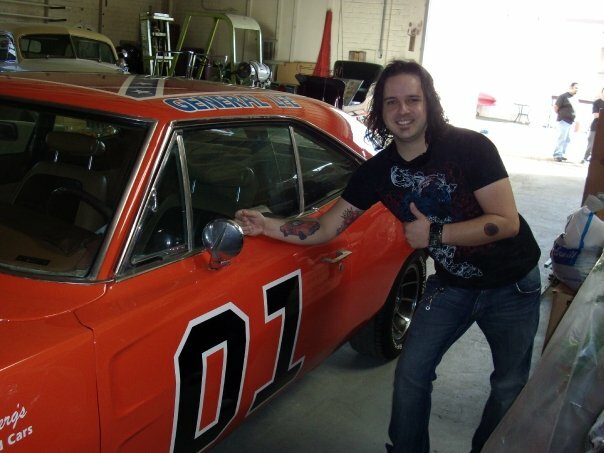 This is Dennis, and he has “inked” his allegiance to KITT and the General Lee on his arms! Now that’s fan dedication! He was just a kid when he met Jen and sat on her first KITT years ago. Vintage TV bringing people together. Awww. 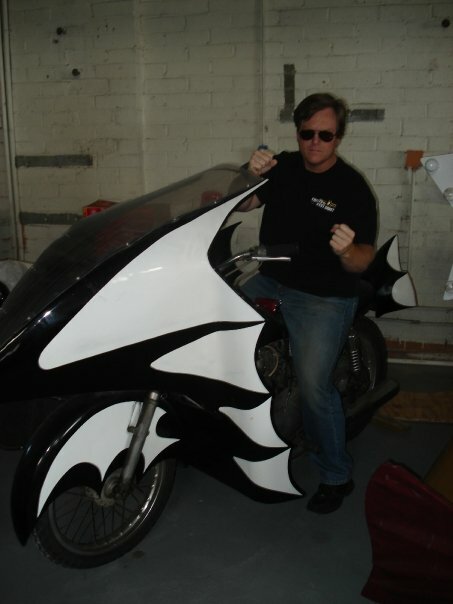 Of course my roots are with Batman, so I headed for the replica Batbike or Batcycle in the back corner for a photo op! Holy no Bat symbols! After a twilight zone moment we reliazed that all the star car guys were a stones throw from Jay’s secret hidding place when we stopped for lunch coming home from Charger Steve’s show a few weeks earlier, we had a good lunch and talked Knight Rider and SPM over cheeseburgers. No, Brian did not put a french fry up his nose, but he almost turned down a chance to drive Jen’s KITT home! With a little encouragment from Nate, Brian got behind the wheel. I think the photo tells the rest of the story! 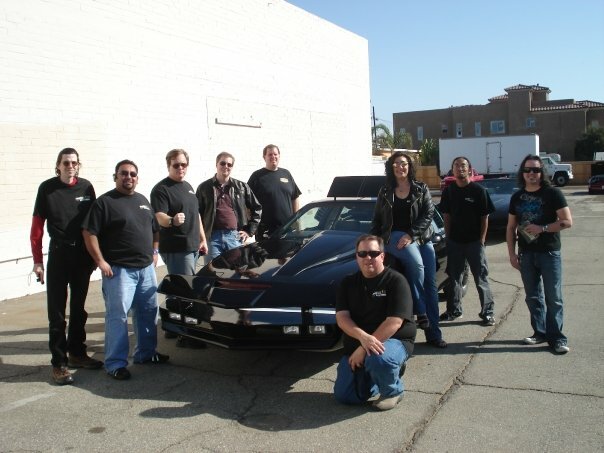 I look forward to driving Jen’s KITT and hitting the SPM button in 2010? Stay tuned starcar fans…. Next: Holy Bat Party, and Parades! Jurassic Park Jeep found! Black Beauty Green Hornet visit? Keaton Batmobile graveyard? Batmobiles and BBQ’s and a bunch of Star Cars! Sometimes it’s “who you know” that gets the star cars to come out, who it’s for, or what you feed them! Lou and Lynda had all three: the inside track as a dependable star car attender, a great BBQ and a fund raiser for Lou’s High School team! We had a good line up again, and we all got comfortable discussing star cars…. and Oscar’s hair, and Brian getting 18 inches…. Here Paul shows Brian where he inserts the cookie dough to make his special cookies. Herbie shows his team spirit and is convinced to buy some raffle tickets. Lou got the prime spot up front, (well he was there first…. and it’s his show….) and Paul was next in line. Herbie tried to make friends with Eleanor, but after the show, Eleanor was gone in 60 seconds…. Coming in at the end, and the last to arrive, Nate’s Batmobile and jennifer’s in process SPM car AKA the “Stunt KITT” with new “matte” paint job…. I still have to teach Brian some tips for his “action pose”…. Show ended, and we hit the streets to go EAT! Here’s a shot that you have never seen before, A Bond BMW, batmobile, and KITT as seen through the window of a Herbie…. 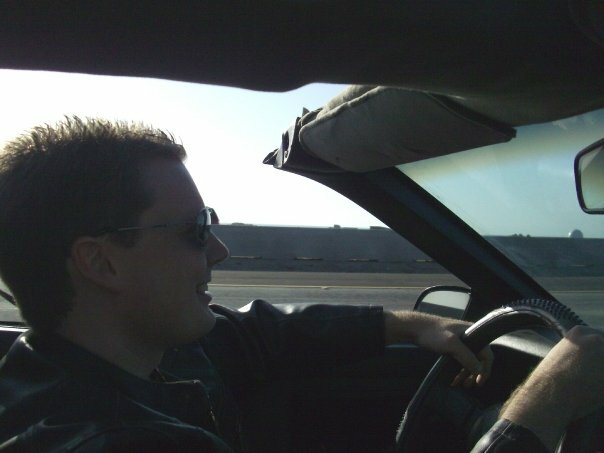 Jennifer had some trouble with her accelerator on the freeway, and kept passing everyone…. Lou tried to hold back his Torino Horses but he just can’t drive 55…. Jason pulled ahead of all of us, to get some “on the go shots” good job! On your mark, get set…. EAT! The Amazing Paul did magic, that was so amazing, jason didn’t take any photos, or he did, and Paul made them dissapear! Next up, a secret trip to a secret star car lair…. Adam-12 and Capt. Sully meet! Mark G. got a special treat at work, he met up with the famous Capt. Sully who did a nice bit of flying and landing in a New York River! Mark got to hook up the training co-pilot equipment, so Sully could get some “stick time”. Way to go, Mark! One Adam-12, see the man…. in the helicopter…..
Getting there is most of the fun… VEGAS! and the rest of the team from the west (Oscar Magnum, Lou Starsky, Bob Fast and Furious, Paul Mad max, Obishawn Starwars and Jerry Tuxedo Herbie) had a good time GETTING to vegas. After meeting outside Vegas, and some trouble with Steve's Bandit, the SCC guys helped each other all get there together. Oscar pulled his Ferrari off of the trailer he rented, and they got Steve's Bandit up on it for the last leg of the trip. Good team work guys! 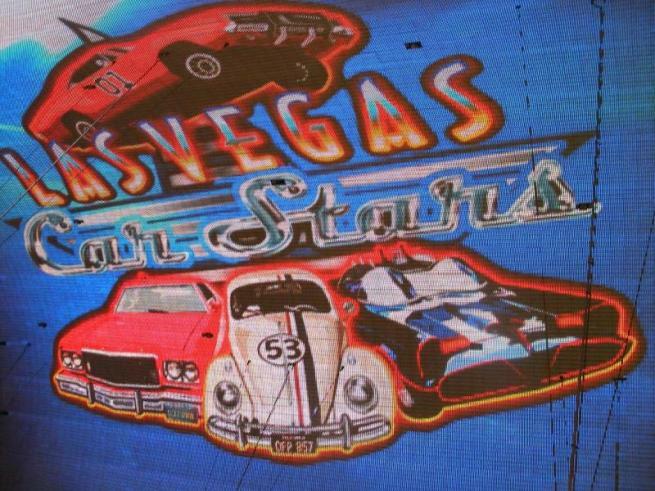 On Saturday the Vegas star cars joined up, a Bumble Bee Camaro, Catherine Hickland’s KITT and Paul Casey’s General Lee along with a vintage police station wagon all rumbled onto Freemont street. The star cars assembled in front of the main stage, to the tune of their own theme song! Mike Towmater with his connections in Vegas set up a great dinner for all the SCC guys (Well, Obishawn went to go see and hear U2) and dispite the challenge of keeping drunks away from their cars, and trying to get food and trips to the bathroom with out any protection for their cars the SCC contingent made the best of it. That’s what I like about these guys, we have a good time where ever we go because of the company! Next, Semi Valley and Lou’s BBQ and fundraiser car show Nov 7th! The year ain’t over yet! Two Christmas parades, a visit to Jay Ohrburgs garage to check out the only Super Pursuit mode KITT in the world, and …? 2009 has been a big year for Starcarcentral.com and all it’s members!